You can help save the koala by reporting the location of koalas sighted in the wild. 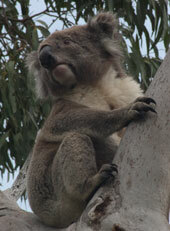 A community koala monitoring web site. It is generally accepted that koala populations in Victoria are plentiful, the species is considered to be a low risk of extinction. There is however, a growing concern in communities that some local populations are decreasing. In the Macedon Ranges we have areas of prime habitat for this iconic animal and it is only by proactive community involvement in gathering information and knowledge, directly dealing with threats to koala populations, and the preservation and enhancement of koala habitat, that can we ensure our local koalas survival for decades to come. Macedon Ranges Shire koalas survival depends entirely on us. 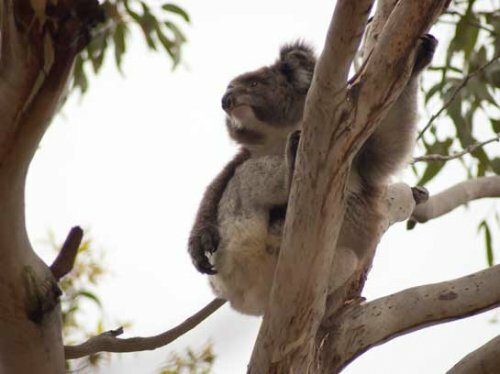 Gather community sightings of koalas throughout the Macedon Ranges Shire and surrounding districts and record them on a database. Provide an insight and better understanding of koalas: how they live, were they live. “Get to know them better”. Promote awareness of habitat needs and habitat conservation. "What to grow and where." Raise awareness to any threats to koala populations. Use information gathered from this project and other feedback, to address issues relating to the preservation of koalas in our Shire. The Macedon Ranges Koala Project is an initiative of wildlife rehabiltators and rescuers from the Macedon Ranges Wildlife Network. It is supported by the Macedon Ranges Shire Council. David Fleay realised the importance of endangered species early in his career when, in 1933, he was the last person to photograph a captive Tasmanian tiger at the Hobart zoo. Fleay's interest in the natural world coincided with the awakening of scientific interest in endangered species, and the realisation by the public, that Australian animals were worthy of attention other than as a source of food.